Set within a fantastic development in a quiet cul-de-sac this lovely one bedroom ground floor flat offers a spacious dual-aspect reception room, smart fitted kitchen and well-proportioned double bedroom. Ashhurst Close is a peaceful cul-de-sac well situated in close proximity to a fantastic selection of local amenities as well as Anerley Station which provides superb links into central London. Fantastic independent café, home and garden centre. 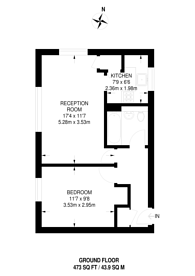 473 (43 Sq M) approx.